by Sham Persaud DPM, MS 1* , Anthony Chesser DPM 1 , Karl Saltrick DPM 1 The Foot and Ankle Online Journal 10 (4): 4 Metatarsal fractures represent a common fracture type accounting for 35% of all fractures within the foot and 5% of total skeletal fractures annually. Central metatarsal fractures are caused by excess torsional force applied to the bone or direct trauma, with most fractures being attributed to the latter. 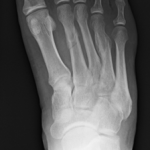 As with most fractures, minimally displaced fractures of the central metatarsals are amenable to conservative treatment including protected immobilization and RICE therapy.